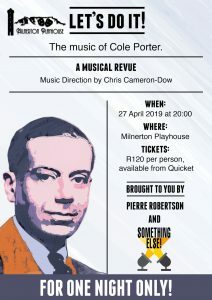 26 APRIL 2019 AT 7PM – at MILNERTON PLAYHOUSE. 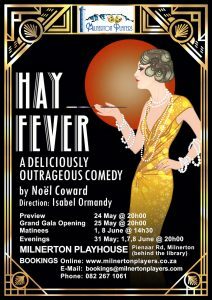 Milnerton Players is an amateur theatre company founded 40 years ago. 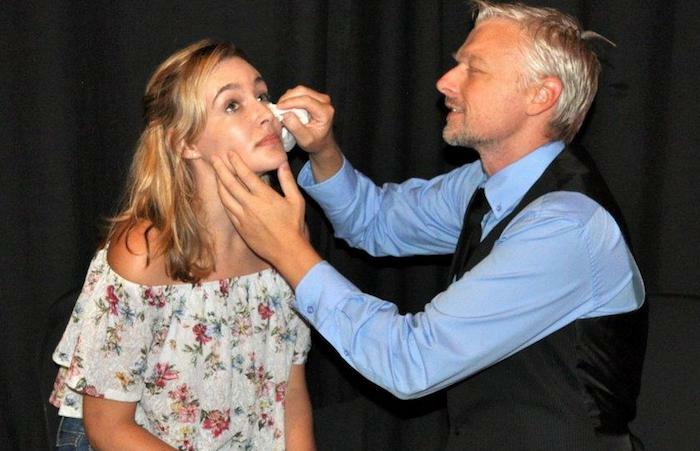 The Players have been successfully presenting dramas, musicals, comedies and other on stage entertainment, at the Milnerton Playhouse in Pienaar Road, Milnerton for 30 years now. Our happy, award winning director Judith Herbig and her equally happy cast, Thomas van Niekerk, Tania Lemme and Petra Baker, who were all nominees. Congratulations Judith and Trevor and all our nominees. You have done the society proud! 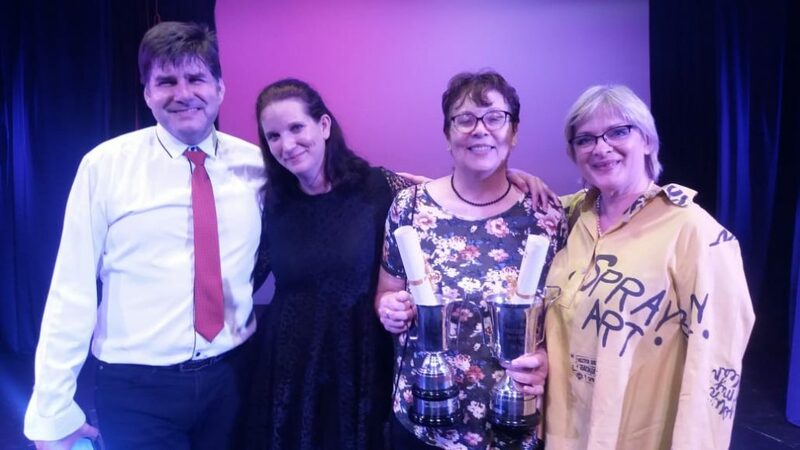 The CATA 2018 (Cape Amateur Theatre) Awards was held at the Masque Theatre on Monday 25 February, we were delighted to be awarded three of the big ones. Miracle on South Division Street won the award for the Best Play and Judith Herbig was awarded Best Director of a Play for the same production. Trevor Joubert won the Best Supporting Actor in a Play award for his role as Uncle Bernie in The Christmas Spirit. The CATA panel saw a total of 20 plays and musical productions in 2018 and we were honoured to have been nominated in twenty-one categories. 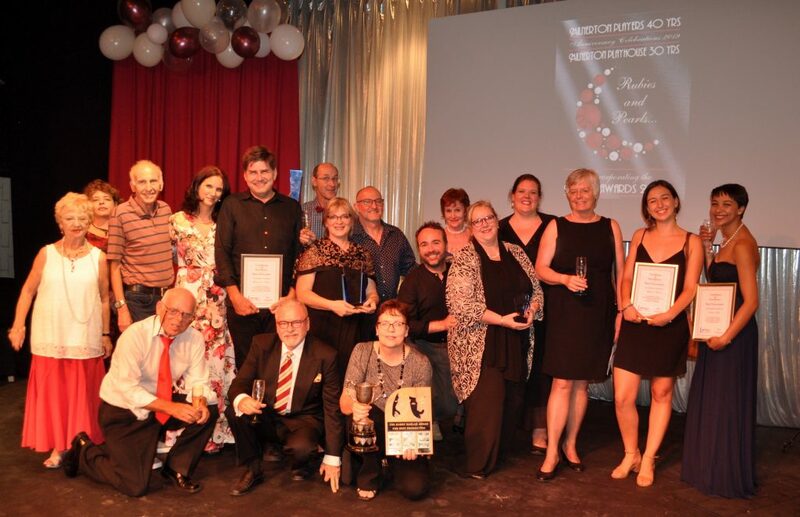 It was an evening of nostalgic entertainment at the Milnerton Playhouse when the 2018 Milly’s Awards were celebrated along with the milestones of 40 years of the Milnerton Players and 30 years of the Playhouse. The glitzy theme of Rubies and Pearls represented the landmark anniversaries and the playhouse was decked out in all its finery. Guests added to the glamour but it was the evening’s show, directed by veteran Sheila McCormick, which captivated the audience. From the early days of the Players, founder member Isabel Ormandy gave guests a window on how the players were formed and some of those highlights. Followed by McCormick’s colourful rendition of the building of the Playhouse the milestones captured the total of 130 plays and musicals performed on the stage since 1990 and the members had much to be proud of. Fast forward to today and the Milly’s showed once again the high calibre of shows of 2018. 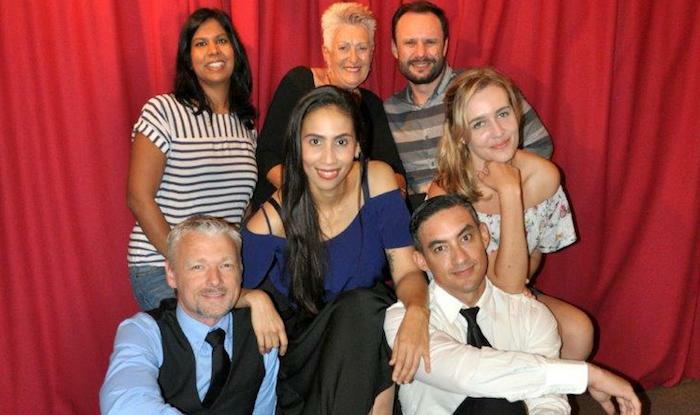 Four shows were presented by the players in 2018; Miracle on South Division Street saw Judith Herbig scoop best director and best production, Petra Baker best actress and Robin Botha best supporting actress with Thomas van Niekerk and Robin Botha as best newcomers. The rollicking musical Nunsense collected seven awards including a special musical award, best actress in a musical: Michelle Galloway; best costumes – Hannelore and Philippa van Ryneveld; best set – Barry Altwig; technical excellence for lighting – Fin McCormick; artistic contribution – sound – Chen Gong and Pierre Robertson and a best newcomer certificate for Georgina Borros. Dangerous Obsession took a technical excellence award for Colleen Larusso, a best newcomer for director Werner Steffen and Tammy Clarke & Winifred Botha an artistic excellence certificate for their backdrop. Trevor Joubert won best supporting actor and Nakita Allen a best newcomer certificate for The Christmas Spirit. Interspersed with the awards were performances from some of the various musicals that had been highlights of the past 30 years bringing this trip down memory lane full circle. Accolades and recognition for 35 years of service were given to veterans Sheila and Fin McCormick as well as awards in recognition of outstanding work over the past year; Werner Steffen , Trevor Lind, Barry Strick, Colleen Larusso, Lynne Wade and Inspire Furniture Rental. Colleen Larusso – The Willy Sass Award for best social evening and Barry Strick for most promising newcomer. Certainly an evening which will reside in people’s memories for many a year. 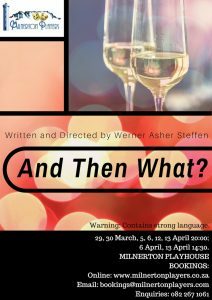 Upcoming productions to look forward to are the world premiere of local playwright Werner Steffen’s And Then What ? 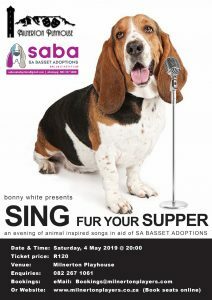 from March 29 to April 13, Sing Fur your Supper – fundraiser for SA Bassett Adoptions on May 4, and a new production of Hay Fever directed by Isabel Ormandy from May 24 to June 8. The production of these shows relies on a dedicated body of members that support the theatre either through their attendance and promoting our shows to their family and friends or for those wanting a more hands on experience – we are always looking for members to assist with our productions.